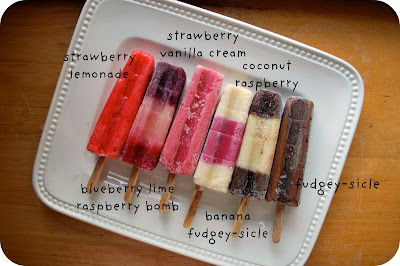 I made more popsicles again this summer--really, I made enough that I could open my own frozen confection shop in my 'hood. I made 6 new flavors, in addition to a couple of our faves from last year (pineapple coconut & orange vanilla cream--recipes here). I am telling you though, this year's layered coconut raspberry is lovely--and the strawberry lemonade really hits the spot on a hot, hot day (or day after hot, hot day as has been case up here this summer where the weather has felt like you are living inside someone's moist, fetid breath). Mostly, I just want to be the mom all the kids like because she dolls out popsicles like they are smiles--despite her humidity frazzled hair and mood. Blueberry lime raspberry bomb pop anyone? i just read through all the recipes and got so excited. yum. guess now i have a reason to get a popsicle mold!